Colby and I have been living in our home together since fall of 2010, about a year before we got married. It’s almost embarrassing to admit that we – two people who own a landscaping company – just finished landscaping around our home last month. I use the word “finished” loosely, because concrete forms and rebar lay where a concrete patio will one day be poured. We’re working on two concrete projects as I write this, and, as always, those come first! Dicentra spectabilis aka Bleeding heart was the first plant I ever fell in love with in our own garden. It’s without exaggeration that I say the experience of having a landscape has transformed my life. If the day starts to feel too demanding, I step outside to listen to the sound of our water feature and watch as birds fly from surrounding alder trees onto our emerging lawn to nibble on grass seed. I take note of how much my Gunnera has grown from the day before (not much), and look for signs of pink buds on my Weigela (yes, they’re there!). Without a doubt, it’s therapy and a refuge from the stresses of life. Birds love to bathe in our water feature. And we love to watch as they dunk and shake! This is our trade, so naturally I can’t help but reflect on some things that I’ve known for some time, but have now had the chance to observe in our own landscape. Birds love grass seed, and they will invite all their friends to the party on a new lawn. After hydroseed is sprayed or a lawn renovation has been done, a reserve of grass seed is necessary to have on hand. There are a lot of grass seeds on the market. For our region, it’s best to go with a blend that’s 70% perennial ryegrass, 30% fescue. Features can – and ideally, will – perform multiple functions. Large, decorative boulders anchor the soil of our raised beds in place, function as a border between our water feature and patio, and offer a place to sit. And they look good, too. A garden is never done. We planted the beds around our entry a few years ago, and last month I edited out a few shrubs that were intentionally planted too closely together. I also swapped out a trio of Hostas for one Daphne. We plant lovers change our minds about what we want in a certain spot, and why not? Harmony achieved through foliage color is soothing to the eye and the senses, and can be more gratifying than interesting blooms. Seeing the combination of chartreuse, deep green and blue brings me inner peace. Dramatic, yes, but true! Nature creates conditions that we constantly have to work against. 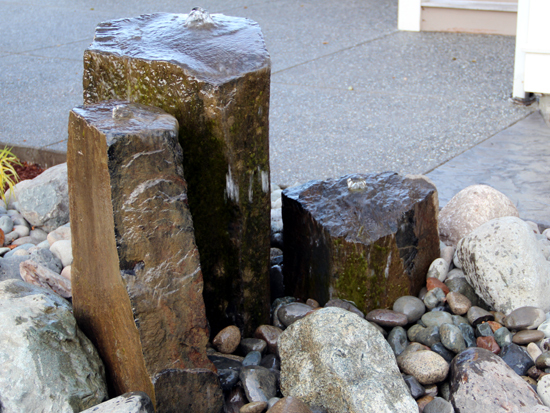 Here, specifically, I’m talking about the algae that’s forming on the rocks of our water feature. We’ll go with an environmentally friendly solution so that we can continue to feel good about the birds bathing in it along with the frogs that keep me up at night! Sambucus nigra ‘Eva’ aka Black Lace elderberry is a stunner. 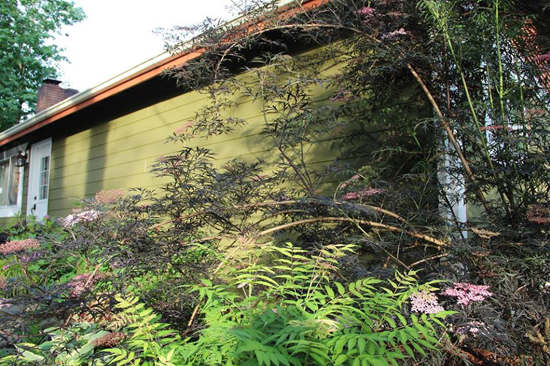 Here in our front yard bed, it’s planted with Sorbaria sorbifolia ‘Sem’ aka False spirea. Considering all the beauty and moments of delight our landscape has brought to us, I can’t believe we waited this long to give ourselves the gift that we give to our clients. 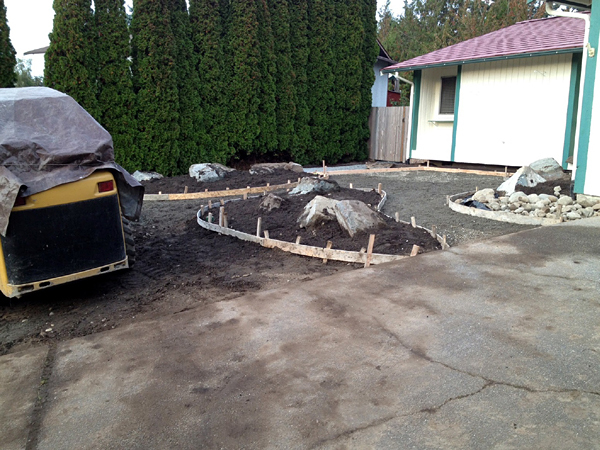 We’ve always put everyone else’s landscaping needs before our own! One thing is for certain, when we finally leave this home, I won’t make this mistake again. In fact, I’ve already started a list of trees and plants that I want planted in my next garden. Are you in the planning stages of your dream landscape? Call our office at 360-697-3215 or send an email to info@northwestcl.com to set up an appointment to meet with an estimator. Thanks for reading our blog. 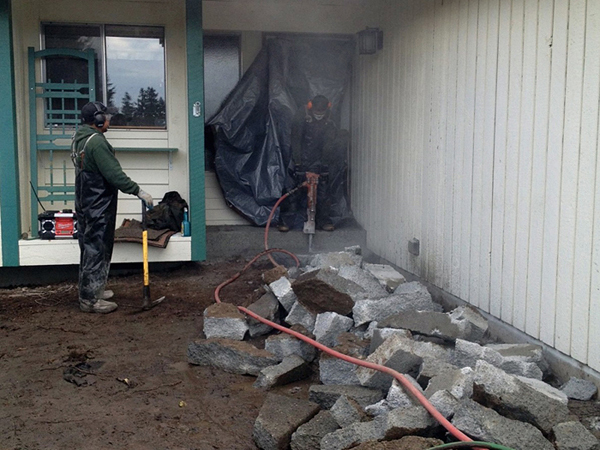 Northwest Construction & Landscape, LLC is a Kitsap County landscaping company that offers landscaping, decorative concrete and lawn maintenance services to homes and businesses across Kitsap and Pierce counties.Subscribe to our monthly newsletter here. This Poulsbo concrete driveway and water feature project was a collaboration between us and our client, Margaret, whose serene property in the Lofall area overlooks the Puget Sound and features a naturally-occurring stream, edible garden, flagstone patio sitting area, Japanese maple trees grown by her son, and retired racing pigeons. How’s that for interestingness? After meeting with two other contractors, she chose to go with us because we specialize in both landscaping and concrete, and the combination was exactly what she needed to execute her plan. 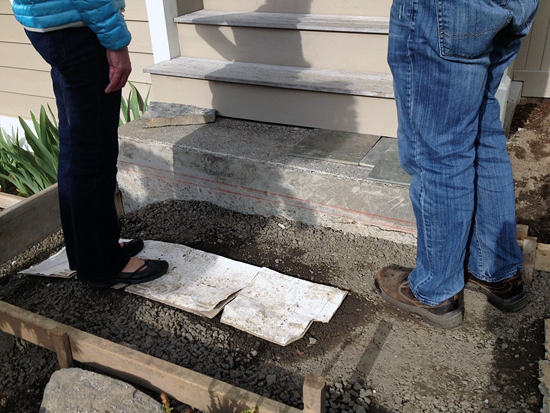 In addition to ripping out the old and unsightly existing concrete driveway, there was a crooked concrete step connecting her porch to her front entry walkway that needed to be replaced. The materials she considered instead of concrete at the start of the project included flagstone and tile. Margaret and Colby discuss material options for the step. A concrete overlay was the chosen solution. For practical purposes, she wanted an exposed aggregate finish for the driveway, but the driveway was just one part of the concrete installation. It conjoined the entry walkway that linked the driveway to her back patio. Margaret knew she wanted a contrasting, yet complimentary, finish to the exposed aggregate, yet had concerns about long-term maintenance and her close proximity to salty, marine air. The concrete step overlay was completed after the concrete walkway was poured and finished. The consideration she put forth into selecting the right complimentary finish, texture and color is exactly the kind of involvement we appreciate from our clients. 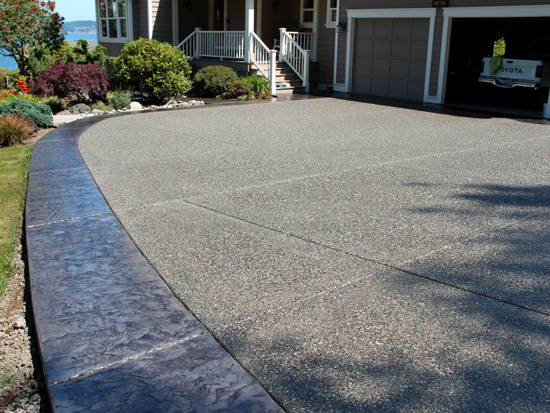 Concrete is longlasting when properly installed, and homeowners use their driveway on a daily basis. The importance of getting these aesthetic considerations just right cannot be overstated. 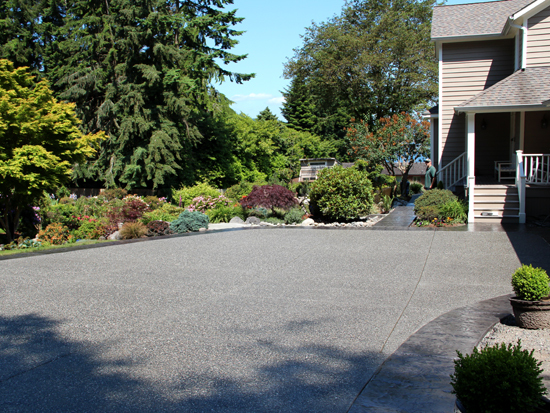 The concrete driveway was sealed with an industrial grade sealant to protect it from stains and marine air. Roman Slate texture was selected for the borders of the exposed aggregate concrete driveway and walkway. Going this route—exposed aggregate for the body of the concrete with decorative borders at the outer edge—is a smart option because exposed aggregate is less costly than stamped or textured concrete, and the end result still features decorative customization. Interesting sidenote: the shed-like structure in the back houses the retired racing pigeons. Silversmoke was the color selected for integral coloring of all of the textured concrete, which was enhanced by powder antique release. For added contrast, liquid antique release was used as well. This Roman Slate textured walkway connects the driveway to the back patio. Early on, before some of these decisions had been made, Margaret decided that this was the perfect time to also install another water feature in her landscape. The naturally-occurring stream runs parallel with her home and the soothing sound of it is heard throughout the landscape. This new water feature has a different look, feel and sound altogether. The splash and sound of this water feature was well considered prior to its construction. The finished 3-column water feature is somewhat deceptive. Once erect and set in place, the grouping of the basalt columns is quite elegant. Moving them, however, is not! Particularly with an existing landscape that’s mature, with flagstone nearby already set in place. That being said, Colby and Elias enjoyed the process of constructing this water feature as it was our first one of this kind. 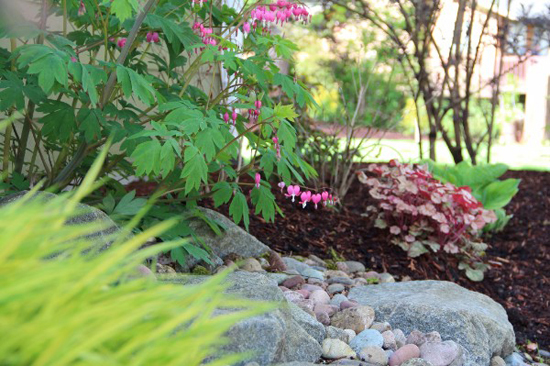 Margaret’s keen sense of plant design beautifully complements all of her hardscape features. 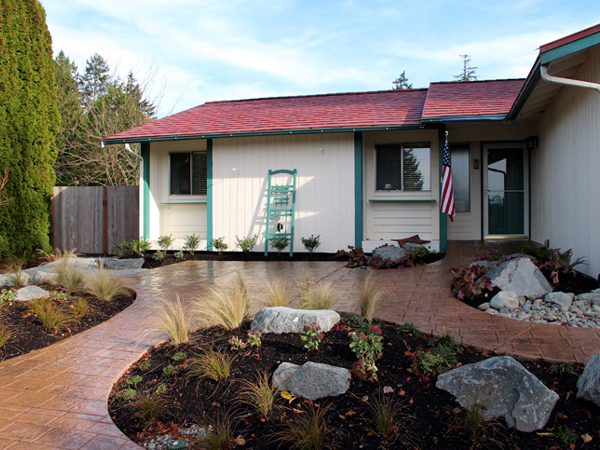 This concrete driveway and water feature project in Poulsbo was a rewarding experience for us because we had the opportunity to work with a landscape that has a lot of soul (yes, this can be felt), is still a work-in-progress (Margaret is already planning the next phase), and is a beautiful reflection of its owner. Log into Facebook and leave us a comment below! Wow, wow, wow – what a way to start the week. The latest WestSound Home & Garden magazine came in the mail today and guess what? We were voted ‘BEST LANDSCAPE COMPANY’ again! Two years in a row now. Thank you to everyone who has supported us and trusted us with their landscape. All of you mean the world to us and we’re so grateful to have you in our corner. WestSound Home & Garden is a beautifully crafted magazine, created specifically for our area – from Bainbridge Island to Gig Harbor. You can pick up a copy at Liberty Bay Books or other local, independent booksellers, garden centers and supermarkets. This backyard patio and walkway project was completed in October. The patio features a random stone stamped concrete border and an ashlar slate stamped concrete body. 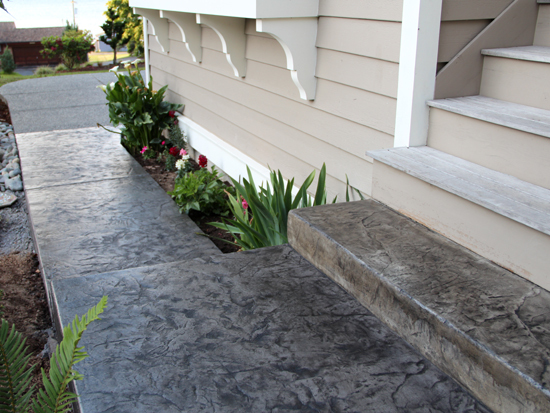 The ashlar slate stamp was also used for the walkway. 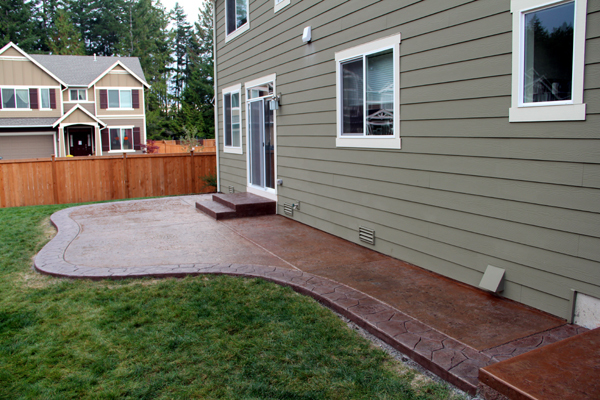 We love stamped concrete projects, and if you keep up with us here on our blog, you already know that! 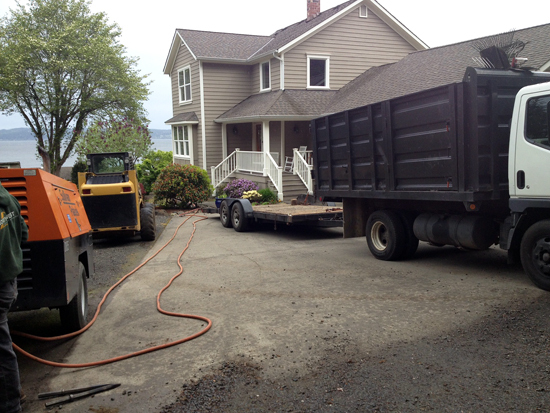 Lawn and an existing exposed aggregate patio were removed. Elias is shown here using a float on the concrete. The concrete has been stamped and is ready for color. Pinto was applied as the color for the body. Mission Brown was applied to the border. 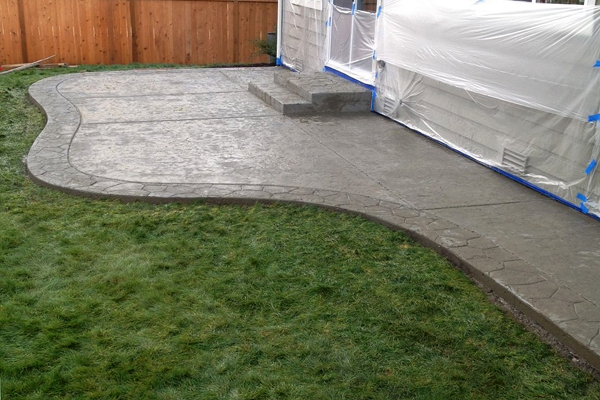 The completed concrete patio and walkway. 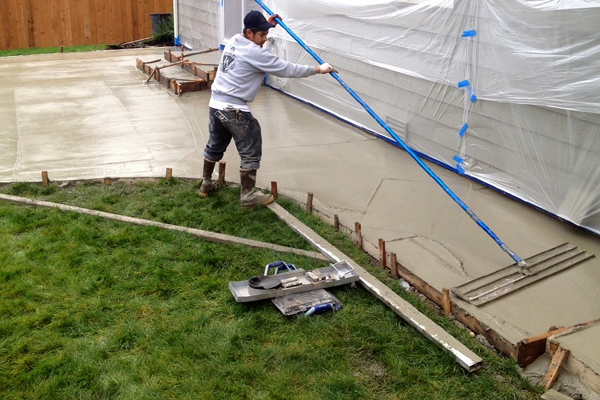 We pour concrete year-round and offer winter discounts. Book your project for February and save money! 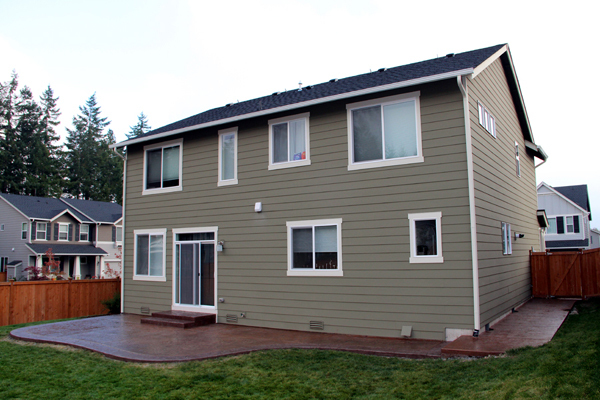 We headed all the way out to Steilacoom for this project. 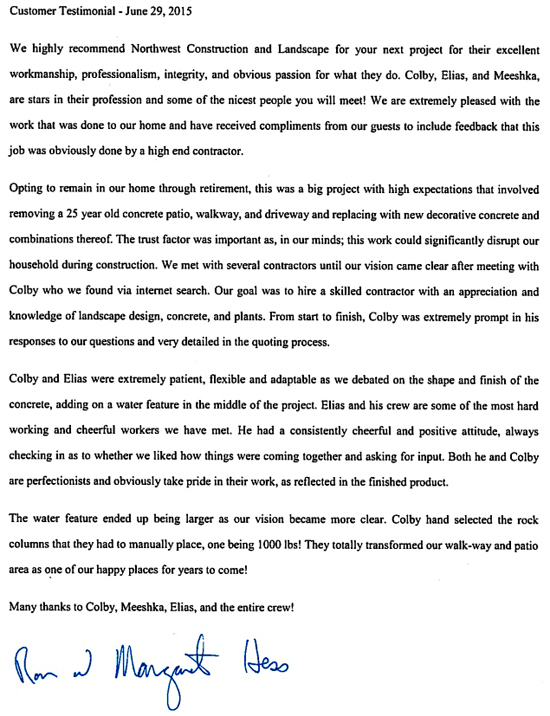 The homeowners were such a pleasure to work for that we didn’t at all mind the extra commute! An added bonus was getting the opportunity to learn about and work with different vendors in that area. The talented Emily Russell ASLA designed this lawnless landscape, creating an additional parking area along with pathways for the homeowners to easily move through their front yard space. Her plan originally called for pavers, but with concrete being a much less costly alternative, the homeowners opted for London Cobblestone stamped concrete instead. 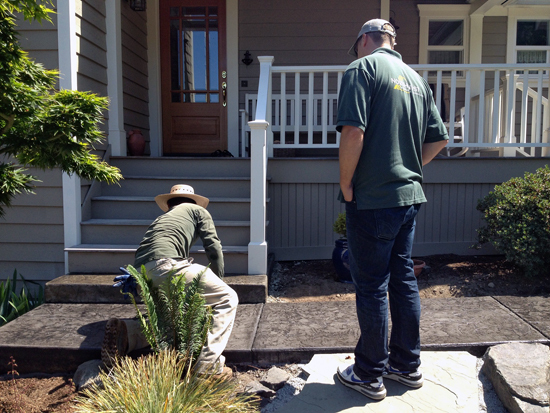 Existing grass and an exposed aggregate concrete walkway and step were removed. 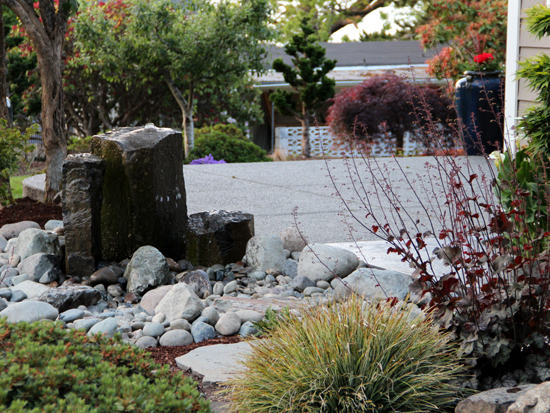 Topsoil and decorative rocks were installed for the creation of landscape beds, bordered with forms for concrete installation. Integral coloring was used for this concrete installation which was done in two separate pours. London Cobblestone stamped concrete before it was antiqued and sealed. After shot. 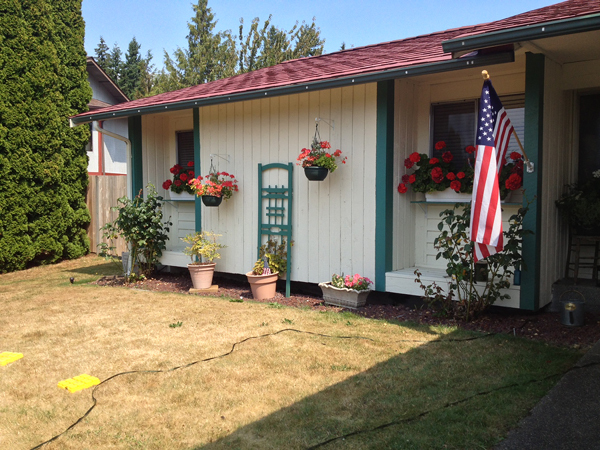 A total front yard landscape transformation! Log in to Facebook and share your thoughts on this project below in the comment section. We look forward to hearing from you. 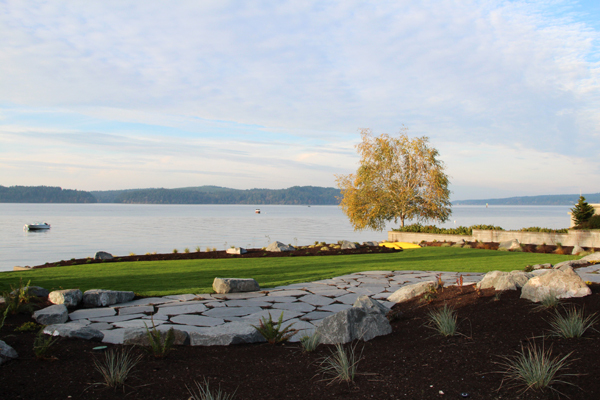 Working on this waterfront landscape installation in Seabeck offered us a stunning view of the Puget Sound and the Olympic Mountains. The homeowners planned a massive renovation of their home and lot, tackling an extensive remodeling project and new landscape at the same time. If the view looks familiar, it’s the same mountainscape featured in this landscape installation we completed earlier this year. Designed by the talented Emily Russell, ASLA, this project features a flagstone patio with a natural stone seating area, stone steps, raised beds, and a new lawn from hydroseed. Invasive species were removed, and native plants such as Oregon grape, salal, and beach strawberry groundcover were planted. 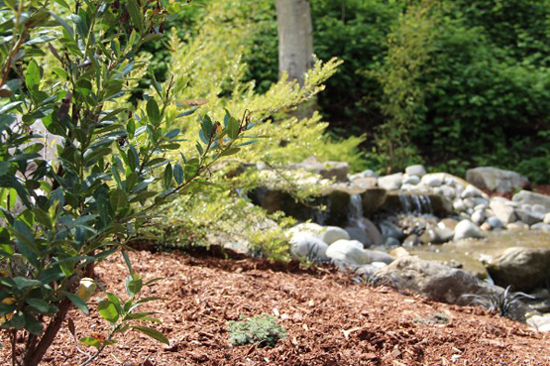 A key feature of this project is a rain garden which acts as a filter to mitigate stormwater runoff before it reaches the Puget Sound, thanks to Christy Christensen of C3 Habitat Corp. who provided her expertise and guidance. 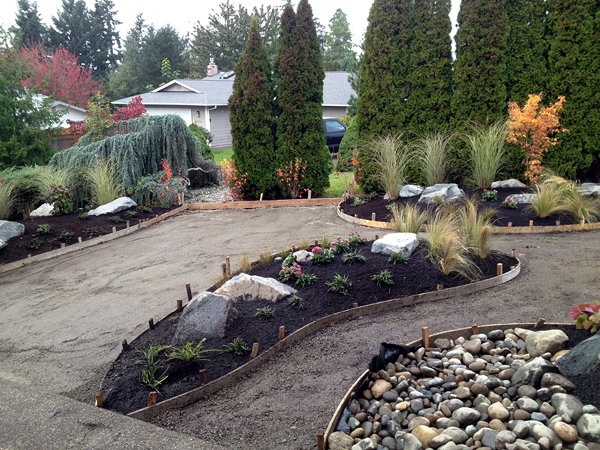 Below are progress photos which document the approach we took to this waterfront landscape installation. 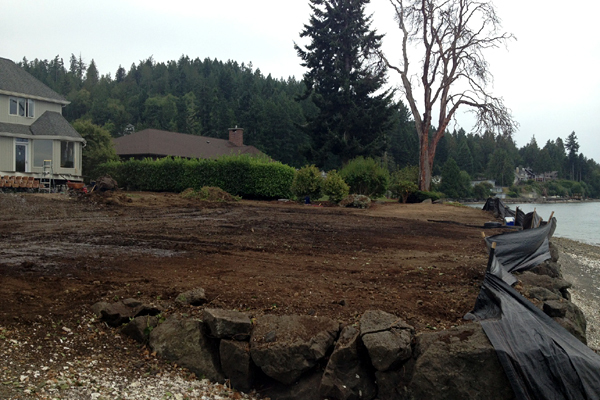 All existing lawn and plant material were removed. It’s pretty amazing to see the transformation that occurs when all that is left is bare dirt. 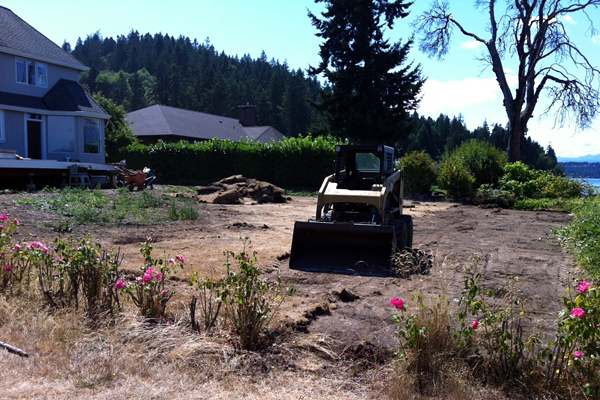 Once we had a clean slate to work with, Vern’s Organic Topsoil was delivered and spread. In our opinion, Vern’s is the best topsoil in the area. It’s full of nutrients and is regularly tested to ensure that it meets the requirements for Grade A organic topsoil. 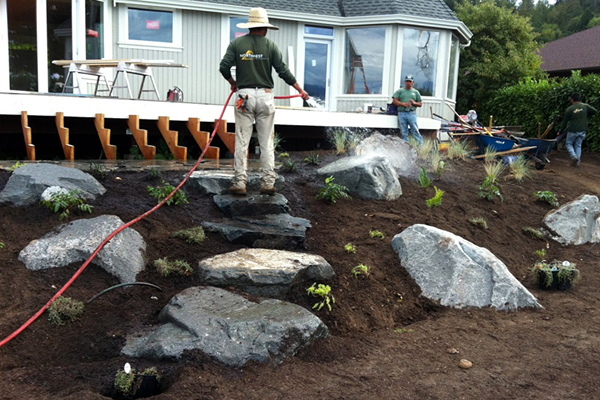 Decorative placement rocks were installed in the large bed that conjoined the deck, along with rock steps. Sedum ‘Angelina’ was planted, along with woolly thyme and blue oat grass. 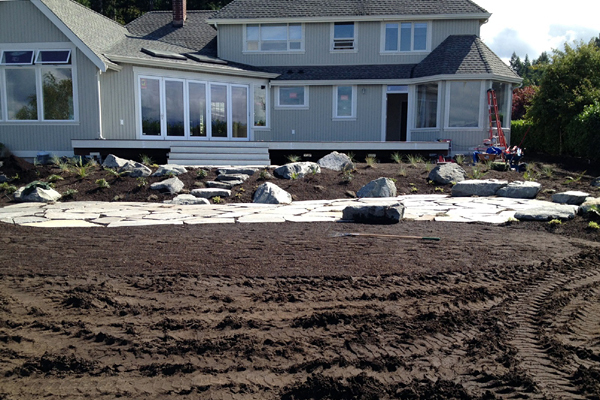 A flagstone patio was installed with decorative placement rocks that act as seating. Finding favorable rock material is a task that requires time and a good amount of patience. Sometimes the best rocks are at the bottom of the pile! The rain garden was installed along the retaining wall on the right. Hydroseed was sprayed for a new lawn. 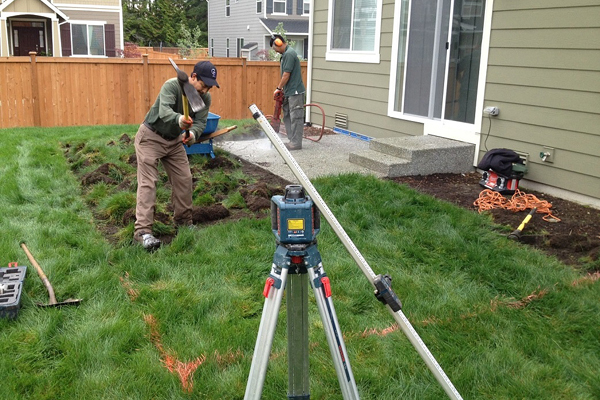 One month later, a lush new lawn had grown in thanks to Hoyt’s Hydroseeding. The homeowners were thrilled with both Emily Russell’s design and the outcome after installation. We very much enjoyed working on this waterfront landscape installation, a true collaboration between all involved. Log in to Facebook and leave a comment below!